Over the years, though, a lot of these applications have developed quite a bit of bloat. Adobe’s own application weighs in at over 26MB, and both Nuance Reader and Nitro Reader aren’t too far behind. If you’re looking for a bulk-free, lightweight alternative, then you should check out Slim PDF Reader. Weighing in at just 1.43MB, this entire application could fit on a floppy disk, and a lack of bloatware means that it’s a lot kinder to your system resources as well, if you’re using an older machine. It’s also compatible with Windows 2000 and above, so if you haven’t upgraded to Windows 7 yet, then you’re still good to go! 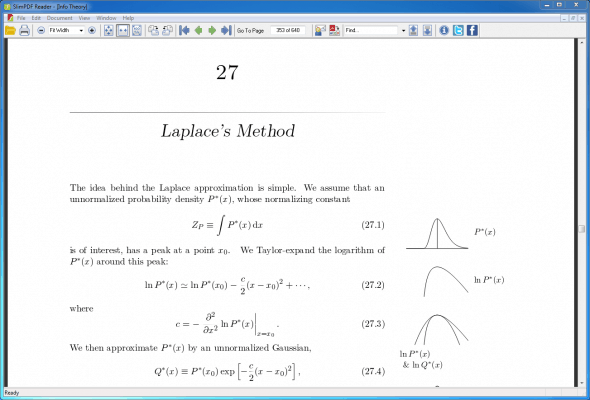 Considering how small the application is, Slim PDF Reader has quite a comprehensive user interface. From within the application, you can open a PDF document, print the document that you’re currently viewing and adjust viewing options. It lacks some more advanced features that Adobe’s PDF reader has, such as annotations, but what else can you expect from a lightweight viewer? It does what it says on the tin, and it does a very good job of it too. As far as resource usage is concerned, Slim PDF Reader plays kindly with your RAM and CPU. It was using 0% CPU on our test machine, and just over 25MB of RAM was being used as well. Put simply, this thing should fly on your 5-year-old machine with 256MB of RAM without slowing everything down around it. Although the interface is stripped down to the bare necessities, there is an option to ‘Convert PDF to Word, Excel, Powerpoint…’ in the ‘Document’ menu from the menu bar. Don’t get your hopes up though, remember that this is a 1.43MB program, and just as my gut instinct told me, it won’t actually convert your PDF documents. Instead, it very kindly offers you a free trial of another program from the same company that does just that job. If this was paid software, I’d have a few complaints about such a plug, but you can’t really complain given that this is a very useful free replacement for Adobe’s PDF Reader. If you’re sick of bloat filled, resource sucking software just to read a PDF document, then you should look no further than Slim PDF Reader. It will run on virtually any computer you can use without slowing it down significantly, and if you’ve been using Adobe’s own software in the past then you will definitely see a speed increase once you switch to this lightweight option. Again, Slim PDF Reader is available for free, and you can download it right now from Investintech.com. Be sure to check it out, and let us know what you think in the comments! Alternatively, you can tweet us @ZathUK.